This is one of several surviving versions of a pair of andirons that Gouthière originally made for the duchess of Mazarin along with other expensive gilded bronze objects for her Paris town house. 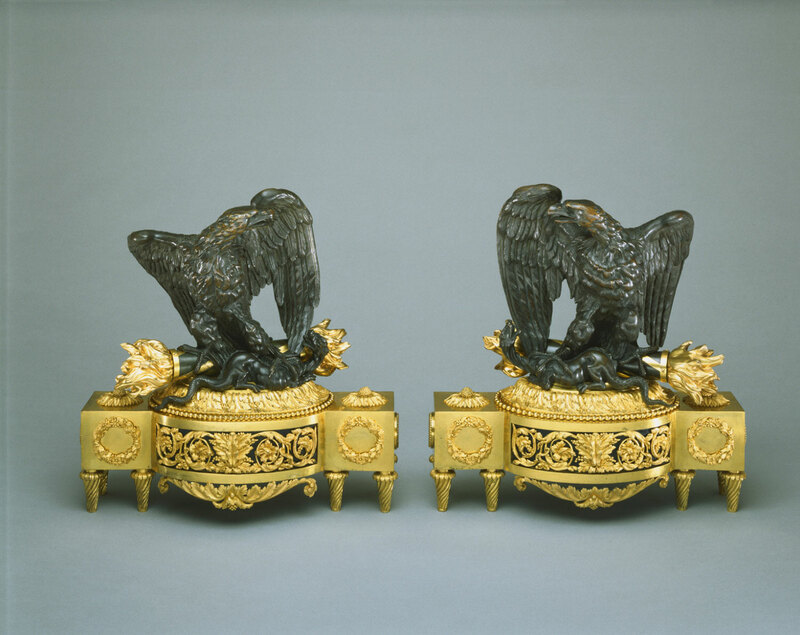 These andirons, decorated with an eagle and salamander, were among the gilded bronze objects made by Pierre Gouthière for the duchess of Mazarin, whose Paris town house was sumptuously redecorated at vast expense in the 1760s and 1770s. The andirons were created for the fireplace of the grand salon, for which Gouthière had already supplied ornamental sculpture as well as fittings for a console table and a pair of pedestals. Celebrated for his skill in finishing cast bronze and for creating varied surface textures with mat and highly burnished gilding, Gouthière defended his high price for the andirons by describing each element that required chasing, mounting, soldering, and repairing as well as the especially requested mat gold with overgilding, which amounted to half the total cost. Like other artisans who worked for the duchess, Gouthière probably remained unpaid: she died covered with debts, and he, who had to advance the costly materials he used, had to declare bankruptcy and close his workshop in 1787. Other versions of the andirons include a pair in the Mobilier National, Paris. Katherine B. Hiesinger, from Philadelphia Museum of Art: Handbook of the Collections (1995), p. 146.